The 2010 edition of "America's Best Graduate Schools" — slated to hit newsstands April 28 and currently available online at www.usnews.com/grad — is the most comprehensive listing of its kind, with more than 1,500 graduate school programs nationwide. In addition to its overall ranking, the Geffen School of Medicine also received high marks in a number of specialty training programs, ranking third in geriatrics, sixth in AIDS, eighth in drug and alcohol abuse programs, and ninth in women's health. "We are thrilled to be recognized for the superb job that the David Geffen School of Medicine does in conducting leading-edge research programs and, at the same time, training high-quality primary care physicians," said Dr. Gerald S. Levey, UCLA vice chancellor for medical sciences and dean of the Geffen School of Medicine. "This is a wonderful tribute to our outstanding physicians, scientists, staff and students, as well as our affiliated hospitals and community partners who help train our stellar graduates." U.S. News & World Report ranked medical schools based on two types of data: peer experts' opinions about program quality and statistical indicators that measure the quality of a school's faculty, research and students. The statistical indicators included both the qualities that students and faculty bring to the educational experience and graduates' achievements linked to their degrees. Among the criteria were students' average undergraduate grade-point average and average medical college admission test score, as well as the school's acceptance rate, total enrollment, faculty-to-student ratio, total National Institutes of Health research funding and average funding per faculty member, and the percentage of graduates entering primary care residencies in the fields of family practice, pediatrics and internal medicine. The specialty training program rankings were based solely on peer ratings by medical school deans and senior faculty. 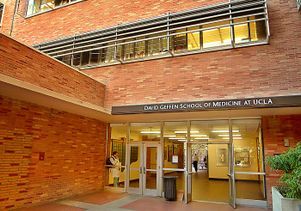 Founded in 1951, the David Geffen School of Medicine at UCLA is the youngest medical school to be ranked among the top 11 in the nation. The school has more than 2,000 full-time faculty members, including recipients of the Nobel Prize, the Pulitzer Prize and the National Medal of Science. The David Geffen School of Medicine is affiliated with the Ronald Reagan UCLA Medical Center, ranked the best hospital in the western United States for 19 consecutive years and No. 3 among the nation's hospitals by U.S. News & World Report. The I.M. Pei-designed medical center features 520 spacious private rooms for patients and the most advanced medical technology in the world.